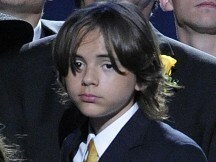 Prince Michael Jackson is to make his first solo public appearance at a charity auction in Germany. The late Michael Jackson's eldest son will attend the auction in Berlin on November 10 in support of the Tribute to Bambi foundation, which supports organisations in Germany that aid needy children, a cause close to his father's heart. Prince Michael, 14, will walk the red carpet and then present his dad's handwritten manuscript of his composition of the hit Bad to be sold in aid of the charity, People reports. Bids for the manuscript are being accepted online before November 10 at www.unitedcharity.com. Michael's mother Katherine, 81, is now legal guardian to Prince Michael and his 13-year-old sister Paris and ten-year-old brother Blanket. In an interview with the Daily Mail she revealed their grief still affects them two years after their father's death. She said: "Paris, Prince and Blanket suffer in different ways. Prince tried to be stronger than the others. He wants to be a man. He doesn't want people to see what's inside." She added: "They are all going to be like him, especially Paris. She has pictures of him hanging all over her wall. She took a pillow and one of his jackets, and said, 'I don't ever want it cleaned. He's worn it and it smells of him and I don't ever want the smell to go away'." But Katherine also told how they live happy, normal lives, saying: "They're good kids and I don't have that much to worry about. They have their friends over. They ride their bikes. "They go to acting school and they love that, although Paris doesn't need lessons." In case it was ever in doubt, Jedward's cheesiness has reached full maturity with a new portrait of the Irish pop twins. Sir Paul McCartney was joined by his glamorous fiancee and a host of A-list celebrities at the world premiere of his first-ever ballet score in New York. Record bosses have had to create a new flying pig for a Pink Floyd promotional stunt - after the original cover star was found to be leaky. Robert Whitaker, the photographer behind many of the most famous images from the first half of the Beatles' career, has died. Mick Jagger steered clear of egos while forming his new supergroup.The Rolling Stone has created an all-star band, SuperHeavy, with Eurythmics founder Dave Stewart.